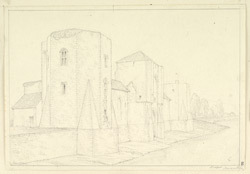 Drawing of Newport Castle in Monmoutshire (now in the county of Gwent). This view shows the long curtain wall of the castle facing the River Usk. This stretch of curtain wall is the only part of the castle still standing and it once formed part of a quadrangle enclosure. The centre tower is the watergate - at high tide small ships could dock in the lower part of the tower. Above the watergate was the chapel, and the portcullises protecting the watergate lifted up into the chapel. On either side of the watergate tower are two polygonal towers, which as this drawing shows rest on spur bases. The castle is an 15th century remodelling of an earlier mid 13th century castle.